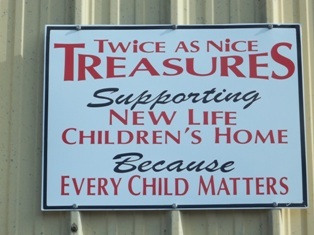 New Life Children’s Home has opened a Second Hand Store at 712B Malcolm Street across from the Smokehouse restaurant in Newport, Arkansas. We have a variety of items including furniture, bicycles, toys, electronics, clothes and a variety of what-nots. These things are all very reasonably priced and all proceeds go to New Life Children’s Home. These proceeds really do make a difference. The New Life Children’s Home’s max capacity is twenty-four children. To learn more, click on NLCH page. If you are interested in becoming a monthly sponsor please contact us by email or phone. We would love to see you at the store or if you would simply like to make donations, please call 870-523-8413. You can also Donate Online. God bless you and thank you for making a difference. All proceeds go to the New Life Children’s Home.